AppTracker has always supported the idea of notifications either via email or directly inside the application itself. The in-app notifications work much like Outlook’s popup for new email and just as in Outlook if you miss the notification it’s gone. To address this we have added a Notification Center to AppTracker; this holds the last 50 messages received by the application. These can be viewed by clicking the icon in the upper right corner of the screen. To subscribe to the various different notifications in AppTracker you simple click the “My Settings” tab and pick from the list of available notifications. One of our design goals with AppTracker was to make it as customisable as possible. We are able to model any application migration process and even track non-application migrations, such as server migrations, build releases or user migrations… more on that in a later post. The default configuration of AppTracker comes with a lot of possible customisations pre-configured for you. We model a standard application migration process and then allow you to completely customise AppTracker for your project. All of this application information is stored in the various Application Tabs. The App Details Tab lists all of the most important application information on one screen. It is split into eight sections, plus a list of notes. The number of notes currently added to this application is shown as a counter in the tab name, e.g. “App Details (6)”. The tool bar gives you access to actions where you can save your changes, reload the application (discarding any changes), generate a PRF Word document, add notes and raise a new version of the application while carrying over all of the application knowledge to the new application. Blueprints – The list of Blueprints this application is a part of. Flags – List of possible user defined flags that can be toggled on/off for this application. Misc. Info – Some extra information (date entered process, time in process, date required, due in (weeks)). Description – A short description of the application. On Hold – Shows if this application is currently on hold and how long it’s been on hold in its lifetime. Notes – A list of notes added to this application to date. The notes also show the date it was added, who added it and the process it was related to. The Discovery Tab is one of our most flexible tabs and requires a dedicated post to describe how to setup and configure it. For now, we'll give you a summary of what it looks like. Traditionally Discovery has been done in the form of Word docs and questionnaires. Our Discovery Tab models this by allowing you to create an unlimited number of questions and sections. However, the information is stored in AppTracker and not in loose Word documents. This means everything about an application is stored in a searchable and reportable manner. A change history of all this information can be recorded in case you need to look back in time to an earlier version. Your Discovery Tab is your single version of the truth of the application’s information. This information can be exported as a Word doc for sending to your customer or off-shore team. Headers – This highlights the header but does not pose a question; good for creating sub sections. AppTracker provides three blank custom tabs that you can name and populate using AppTracker’s Questionnaire forms. These tabs work exactly the same as the Discovery Tab above. The App Testing Tab is another Tab that deserves its own post and will get one soon but for now here is a brief introduction. The App Testing Tab is used for scheduling, signing off and reporting on tests such as UAT tests, OAT tests and client specific tests etc. To create an App Test..
You can send an email from within AppTracker to the user with all the details they need to conduct the test including an RDP attachment and ICS calendar invite. The email received contains a link to a web address that is part of the AppTracker system. Clicking the link takes the user to a questionnaire of standard UAT sign off questions (defined by you). The user can then flag the test as a Success or Fail. It is possible to have AppTracker send you an email notification for these sign offs. The App Testing tab is split into two sections. The top half is a grid view of all current tests and their results. From here you can edit a test, resend emails and view test results. The lower half shows a calendar view of upcoming tests and their results. These are colour coded by their result; Green – Pass, Red – Fail , Amber – Untested. 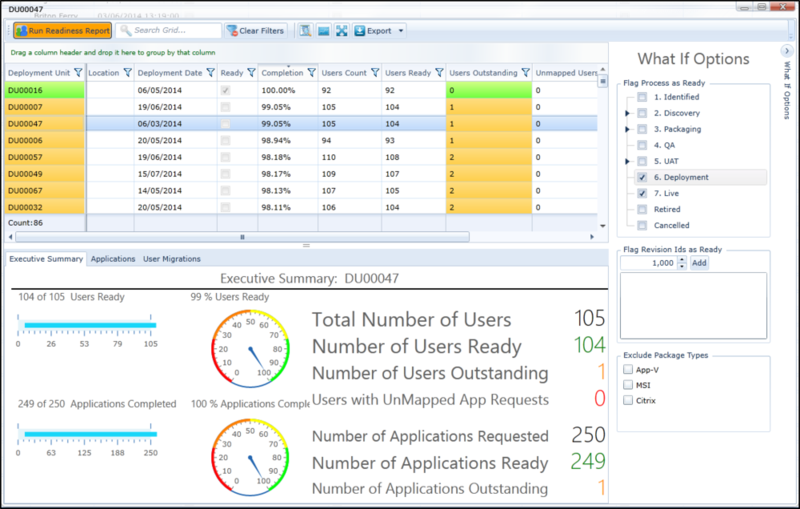 Much of the reporting on Application Tests can be done from the main Applications Grid. Applications can have contacts associated with them; these are people such as UAT testers, Discovery contacts and application owners etc. The types of contacts listed here can be edited by you. The number of contacts currently associated with this application is shown in the tab name. i.e. “Contacts (3)”. The contacts toolbar lets you search for existing contacts, add contacts to this application and create new contacts. It is possible to set up three different types of dependencies in AppTracker. You can add a pre-requisite, a post-requisite or an alternate application. The alternate application information can be useful if you are trying to consolidate different applications or versions e.g. adding Photoshop as an alternate application for any imaging editing application in your portfolio. The dependencies tab also shows if the current application is a “dependency-of” any other applications in the portfolio. The number of dependencies currently associated with this application is shown in the tab name. i.e. “Dependencies (2)”. Most application packaging projects will have a QA phase where applications are checked against a list of internal checks. It is possible to model these checks in AppTracker using our Questionnaire forms (see the Discovery Tab). This allows all the QA information that would be normally be captured in a Word doc or Excel sheet to be captured within AppTracker. It is possible to have multiple QA’s per application allowing an application to go through an iterative phase: Package -> QA (fail) –> Repackage –>QA (pass) cycle and retain information on each iteration. 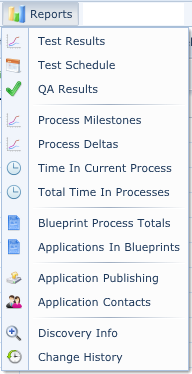 It is also possible to report on groups of applications QA status from the applications grid tool bar “Reports -> QA Results”. The compatibility tab records an application’s various different compatibility issues, the list of issues is user defined; the default list include options such as “Windows 7” , “IE 8”, “Office 2010”. Each of the compatibility entries can be set to 32/64bit and Red/Amber/Green; you can also add a comment as to why the application is in the compatibility status. It is possible to quickly find applications with compatibility issues from the applications grid using the toolbar “Application Filters -> Standard Searches -> Compatibility Issues”. The license tab records some basic license information such as serial keys, codes, quantity and amount used etc. The road map for AppTracker includes reporting on license usage. It is possible to attach different types of documents, images, source files etc. to your application and to tag these attachments as different things, e.g. “Screen Shot”, “License Key”, “Source Files”. Applications that have attachments can be quickly filtered on the applications grid from the toolbar: “Application Filters -> Attachments”. The History Tab contains a complete record of everything that has happened to an application during its life time. This includes events like “Name Changes”, “Process Changes”, “Adding and Signing Off UATs” and adding contacts. All of these changes record the event, the date/time it occurred, the before and after value and the person that made the change. There is a history report available from the toolbar “Reports -> Change History” that allows you to view all the changes to a group of applications for a given date range. Blueprints in AppTracker are an extremely powerful tool. It is our term for a labelled collection of applications. This could be all the applications in a department, in an office, in a site, in a country... It’s up to you! Blueprints are held as a tree structure so you can create many levels of Blueprints to model your project deliverables. All of our reports can be run on Blueprints making our reports very powerful and very granular. Blueprints give you the power to chop up your applications portfolio anyway you want. Rather than looking at list of 3000+ applications and wondering how the project is going you can zoom into a single department and see if all its applications are ready. As Blueprints are held a tree it’s possible to zoom out a level and see how all the departments are doing. There is no limit to how granular you want to make your Blueprints, the more the better. Take a look at the Blueprint tree in the screenshot above. We have Offices > Europe > UK > London. I can filter my applications list to just the applications in London at one click. I can also see the status of all the applications in the UK or Europe … All at one click! As this is linked to reporting we can easily get a report on the progress of all the applications in UK, England, Europe etc. Blueprints are an integral part of AppTracker and as such receive special attention around who can access them and what they can do. If you have an especially large number of AppTracker users (one of our clients has over 450 users / 4000 apps), you might not want all of those users to see all of the applications in the portfolio, only the ones that are relevant to them. It is possible to give an AppTracker user “read-only” or “read write” access to all, some or none of the Blueprints and their associated applications. For example I can give all the UK BA’s access to only the UK Blueprint of applications and they will not see or even be aware of applications outside of those Blueprints. This is another example of how powerful Blueprints can be. There are 18 custom properties available for clients to configure. These are split into 8 textboxes, 5 dropdowns, 3 date/time pickers and 2 date pickers. These properties are displayed on the App Details tab under the blueprints and can also be displayed on the main application grid. Note: Any changes you make in the Admin section are not reflected in AppTracker until after you refresh your browser. The App Detail Fields tab shows all of the available properties in AppTracker and allows you to turn them on/off or rename them. It also allows to you choose which fields are displayed on the main grid. Display As: This is the name of the custom property you are using. Is Visible: Turns the property on in the App Details tab. Grid Index: This controls the order of the columns on the main grid. If you turn on a custom date or dropdown setting the values in bulk becomes available on the main grid. Custom Dates 1-3 display as Date/Time pickers and Custom Dates 4 & 5 display are displayed as date pickers. 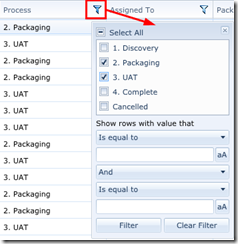 The List 1-5 properties require some extra configuration to populate the options in the dropdowns.